Eldest son of Philip V, King of Spain and of his second wife, Elizabeth Farnesio. 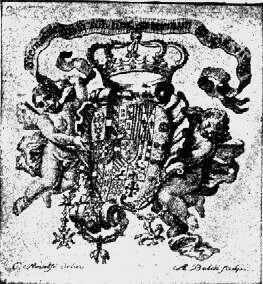 He succeeded his maternal great-uncle Antonio Farnesio, as Duke of Parma and Plaisance in 1731. 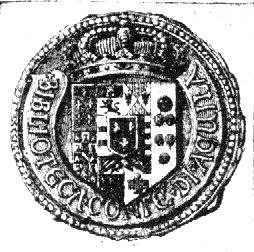 Being also great-grandson of Margaret Médicis, daughter of Cosme II, grand-duke of Tuscany (d. 1621), married to Edward I, duke of Parma, Infant Don Carlos was also recognised as heir of the grand-duchy of Tuscany, in 1737. 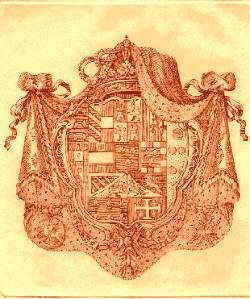 Thus the arms of the Farnese, dukes of Parma and those of the Médicis, grand-dukes of Tuscany. By the Treaties that ended the War of the Polish Succession, Charles had to abandon the Duchy of Parma and his pretensions to Tuscany, which were given to Francis, duke of Lorraine, future emperor Francis I of Austria. 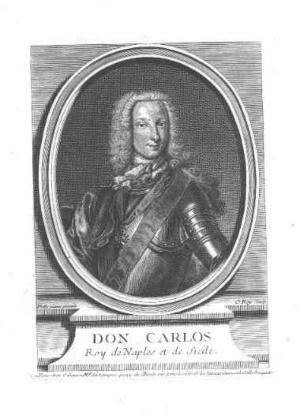 Charles de Bourbon in turn was given the Crown of the Two-Sicilies and the tiltle of King of Jerusalem by the Pope (1738). Blasoning:1. Bourgogne (ancien, sans bordure) et Autriche; 2. Leon et Castille; 3. Aragon et Sicile; 4. Autriche; 5. Anjou (moderne); 6. Bourgogne (ancien); 7. Brabant; 8. Flandre; 9. Tirol ; 10. Anjou ancien (Naples) sans le lambel; 11. Jerusalém; aux flancs, dexter, Parme (Farnése) mal representé, et Portugal; sinister, Toscane (Médicis). Sur le tout, Anjou (moderne). Pending are the crosses of the Sacred Military Constantinian Order of St. George, the Golden Fleece, St. Januarius and the Holy Ghost. 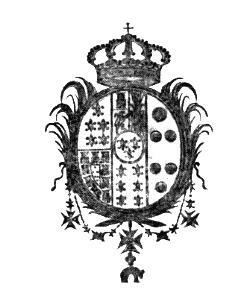 The Farnese, dukes of Parma, bore the arms of Portugal, since Rainuncio I, duke of Parma, who by being the great-grandson of Emmanuel I, King of Portugal, through Infant Dom Duarte, was pretendant to the throne of Portugal in the dynastic crisis of 1580. He undoubtedly detained the genealogical representation of King Emmanuel I, but was outtaken by Philip II, King of Spain who became King of Portugal, although having less rights. His line is today representended by Monseigneur Prince Louis Alphonse, Duke d'Anjou and Duke of Bourbon, as the eldest male descendant of Queen Elizabeth Farnese, who is also the presentHead of the Bourbon Family. Artist: C. Amalfi fecit & A. Baldi sculp. Notes: Son of Francis I, King of the Two Sicilies and of Maria Isabel of Spain. He is the ancestor of the House of the Counts Roccaguglielma who ceased to be dynasts in the Two Sicilies due to the morganatic non-authorised marriage of the prince's son. Bibliography: for the House of Bourbon see, Hervé Pinoteau, « État Présent de la Maison de Bourbon», 4ème ed., Léopard D'Or, Paris, 1991; idem, «L'Héraldique Capétienne en 1976», Nouvelles Éditions Latines, Paris, 1977; idem, «La structure de la maison royale», in «FIDELIS», # 3, (1990), SICRE, Paris, 1990, pp. 1-11; Christophe Levantal, «La Route Royale», Communication & Tradition, Paris, 1996; for the Royal House of Spain see, Fernando García-Mercadal, «Los Títulos y la Heraldica de los Reys de España», Bosch, Barcelona, 1995; for the Royal House of the Two Sicilies see, Jacopo Gelli, «Gli Ex Libris Italiani», reprint of the 1930 ed., Cisalpino - Goliardica, Milano, 1976; Guy Stair Sainty, «The Orders of Chivalry and Merit of the Bourbon Two Sicilies Dynasty», S.M.O.C.S.G., Madrid, 1989; Christophe Papet-Vauban, «Les Rois des Deux-Siciles», in Bourbons Magazine, #9, (1997), pp. 10-11, #10, (1997), pp. 10-11, #12, (1998), pp. 18-19, see, Bourbons Magazine.